The Report tab sheet helps to create and manage reports related to the database contents. A non-functional example can be accessed in the navigation frame via the Projects tab sheet. Select the "Bryophyte Collections" item and open this project in the context menu (right mouse bottom). [In the current version, access to the items in the subtree is disabled.] Subsequently select the Report tab sheet in the data frame. Reports need have an XML-formatted header (and footer). The latter may be deposited as XML documents locally or on server and downloaded from the internet. 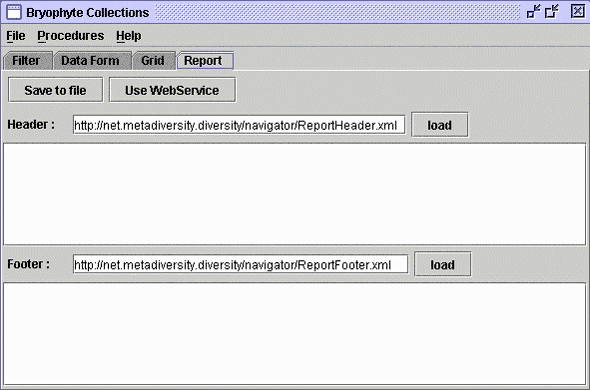 For further processing, the tables may be locally saved or submitted to a Web Service [– the option of selecting between different web services is to be implemented]). This page (revision-1) last changed on 12:21 15-Feb-2007 by unknown.